Weight gain and obesity is a major concern today. The changing lifestyles, fast food, lack of time for exercise are just a few causes of this sudden increase in the number of obese cases we come across. Weight gain directly affects your health: cholesterol levels shoot up, high blood pressure, joint-related issues, heart problems and more than anything, the worst hit is your self-confidence. We all crave for a potion or pill we can just pop in, that would magically just ‘melt’ away all our fat (and worries!). And for this very reason, we easily fall prey to literally anything claiming instant weight loss. While the truth is, there are cases where instant weight loss may occur but at the cost of your well-being. Many a times,these chemicals settle in our bodies that later lead to deadly diseases as a result of accumulation of toxic substances in the body. There is indeed an Elixir of sorts, that Mother Nature has bequeathed unto us i.e. Curcumin. So, what is Curcumin? Curcumin is a component of the Indian spice turmeric (Curcumin longa), a type of ginger. These curcuminoids give turmeric its yellow color. Curcumin’s medicinal benefits date back 6,000 years, when ancient Egyptian pharaohs and Ayurvedic medical practitioners in India first discovered its therapeutic properties, one of which is to help you lose weight. Curcumin is very effective in preventing fat accumulation. The major fat accumulation area in the body is the white adipose tissue. When new blood cells form in the white adipose tissues, this can lead to weight gain. Curcumin prevents these unwanted fats from staying. Studies also show that curcumin decreases the size of adipose tissue, thus lowering fat accumulation. Curcumin possesses Thermogenesic properties. Thermogenesis is a metabolic process that burns off calories in the body and transforms it to energy. This particular process promotes healthy weight loss. Curcumin increases the body’s metabolic rate. The more fat you burn, the more unwanted weight will be gone..
A recent Korean study on Curcumin came up with the conclusion that the modulation of several cellular transduction pathways by curcumin has recently been extended to elucidate the molecular basis for obesity and obesity-related metabolic diseases. These findings might enable novel phytochemical treatment strategies as well as curcumin translation to the clinical practice for the treatment and prevention of obesity-related chronic diseases. Furthermore, the relatively low cost, safety and proven efficacy of curcumin make it advisable to include curcumin as part of healthy diet. This new science also shows that curcumin can help regulate the formation of fat cells and lower the production of leptin in fat cells. This is exciting because 99.9% of overweight people produce excess leptin due to their extra pounds of fat. Unfortunately, excessive leptin is very destructive. For example, too much leptin can cause your liver to accumulate fat cells, leading to “fatty liver” and liver malfunction (including type 2 diabetes). Curcumin can protect your liver from leptin’s negative effects. Another interesting fact is that food sensitivities are also one of the most common causes of weight gain. Fortunately, curcumin can help offset this problem. To understand how, it is important to understand why food sensitivities and obesity go hand in hand. How food sensitivities develop and how they affect your body. Curcumin can help halt this process and prevent you from putting on pounds by fighting inflammation, which decreases or even prevents the symptoms of food allergies and sensitivities. Curcumin’s anti-inflammatory properties can also help relieve allergic symptoms, which are more severe than sensitivity reactions. According to clinical research published in Molecular Nutrition and Food Research in 2008, curcumin “blocks mast cells…from releasing histamine, thereby preventing allergic reactions.” Another one of the curcumin benefits is that it also increases the body’s natural defenses against allergens by increasing antibody response and protecting the immune system. To reap benefits of Curcumin in weight loss, it is important to consume pure unadulterated, chemical free Turmeric having high level of curcumin. 3X-Trimfat is a product of the trusted brand Bagdara Farms, grown, processed and manufactured using the most traditional standards of organic farming, free of artificial fertilizers and pesticides, and having high levels of curcumin. Now is a good time to give your body the chance and health it deserves. This is the one time you won’t mind losing something of yours. And what’s more, you’ll be a newer, better, healthier version of yourself! Will this product be effective in shedding post pregnancy weight? If yes, how do I use it? We totally understand the dip a woman’s inflammation takes with regard to her looks after gaining weight post pregnancy. 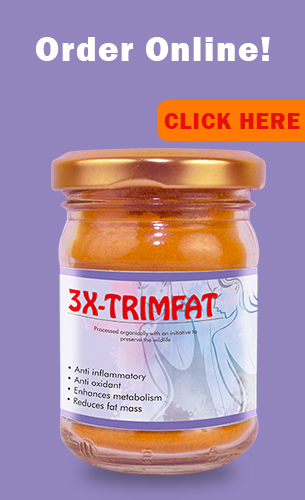 the perfect solution to effective weight loss post pregnancy lies in a product from Bagdara Farms called 3-X Trimfat. It has a rich content of curcumin which helps in weight loss the healthy way owing to its anti-inflammatory and antioxidant properties. As the name suggests, it trims the fat away and is credited with thrice the rate of fat loss as compared to other supplements, that too without any harmful side effects. Please note that it needs to be consumed in small controlled quantities while breastfeeding your baby. Rest, with moderate exercises like an evening walk and healthy eating habits, one will definitely see good results.